In the early days of aviation, pilots used visual landmarks, buildings, railway lines, etc. for orientation and navigation. Under difficult weather conditions or during the night, they could easily loose orientation or the correct bearing. There are different ways for instrument flight: they pilot of an airplane can determine his own position and bearing using on-board instruments in his own plane or he can ask for an aircraft position report from a ground station. Nowadays, he will receive his position taken from radar results. In the years of WW II, there has been a system in use by the Swiss Air Force using a longwave transmitter on board and bearings taken by two or three ground stations. The position was sent back to the aircraft by wireless telephony. In the beginning, trials were made with the on-board communications radio, but this blocked the standard ground station communications frequency for a certain time (only few frequencies could be preset on early aircraft transmitters). To avoid this, a separate transmitter operative in a different frequency range on longwaves was constructed by Borwn Boveri Corp. The Swiss Air Force two-seater airplanes Morane C 3606 have been equipped in 1942. Shortly after, it turned out that the procedure of taking bearings of the aircrafts position was very time consuming: the aircraft had to keep it's position circling, the ground stations had to communicate the identification of the aircraft and the operation frequency of it's transmitter, then they had take the bearings, the position had to be calculated from the results and the position information had to be sent back to the aircraft on it's standard comunications channel. 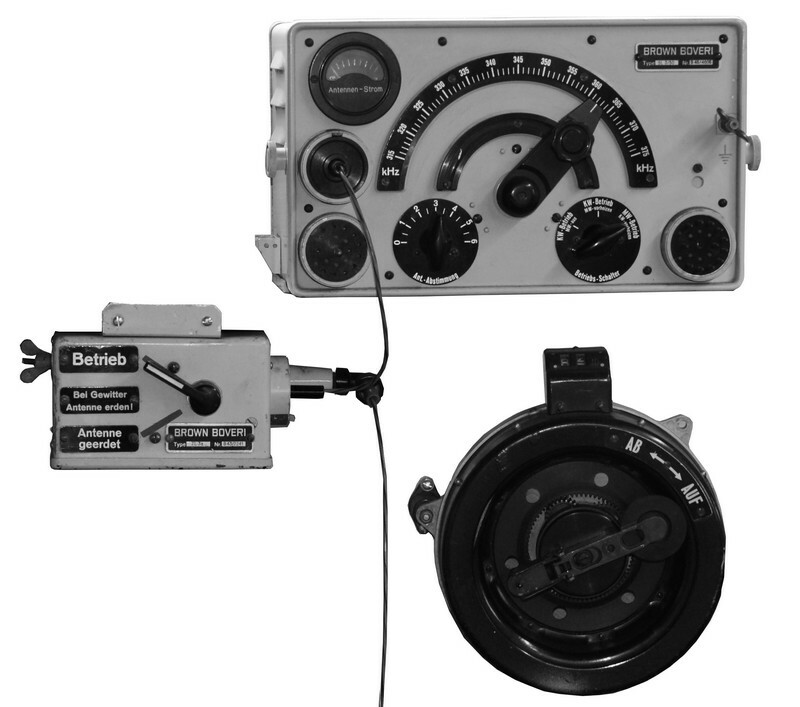 The on-board radio compass transmitter SL 3/50 was used to give a carrier signal from an aircraft that allows bearings to be taken from ground stations to give it a position report. It was installed in front of the observer seat in the two-seater airplane C 3603. The transmitter covers 315 - 375 kHz longwaves, there is a LV1 valve in the oscillator stage, in the HF output stage two parallel LS 50 valves, another LV1 valve is used in an AF monitor amplifier stage. The necessary voltages are taken from the dynamotor power supply of the aircraft's FG X transmitter. The trail antenna with a length of 72 m could be lowered to it's working position from the seat of the oberserver who did operate the equipment. I would be very thankful for further information and images. Information from the Swiss Air Force Museum Dubendorf, where the equipment is displayed.